I’m making progress on my kitchen cabinets. I promise. But I swear to you that every time I think I’m ready to paint a section, I find more wood filling, sanding, and/or caulking that needs to be done. It’s never ending. Or maybe this is me torturing myself with perfectionism. Either way, it’s been slow going. I also decided to paint the cabinets with a brush. I just couldn’t get myself motivated to do all of the taping and draping that was required for spraying these cabinets, so I’m brushing. And to be honest, I have no idea what I think. I thought I would like the black much more than I do, but this isn’t really what I envisioned. 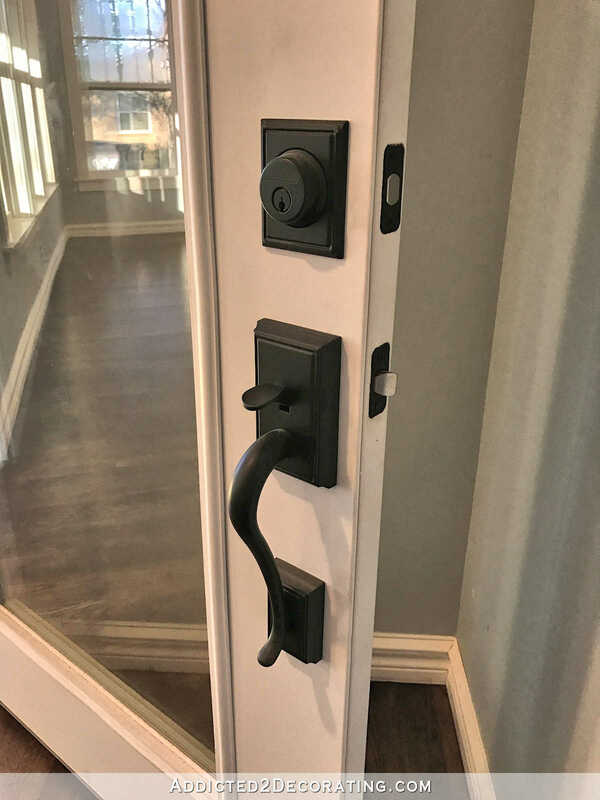 BUT…I also wonder if it’s because the rest of my black door hardware has a really matte finish, and this has a shine to it, which kind of looks cheap. I think a really matte finish with zero shine would look much better. I couldn’t find a matte finish in the spray paint I wanted to use for metal pulls. So if I go this route, I’ll probably want to put a matte clear coat over them to knock out that shine. Anyway, I actually like the brass just a bit more than I had anticipated. It’s a softer look than the black, but I can’t decide if that’s a good thing or a bad thing. So what are your thoughts? Stick with the brass? Or go with matte black? When I first saw your countertops with the color of the doors, I thought a silver finish hardware would be beautiful. You paid so much for that hardware, I can’t imagine spray painting it all, I think the brass is lovely! Cabinet pulls don’t have to match the hardware throughout the house, they are their own statement piece (in my opinion). 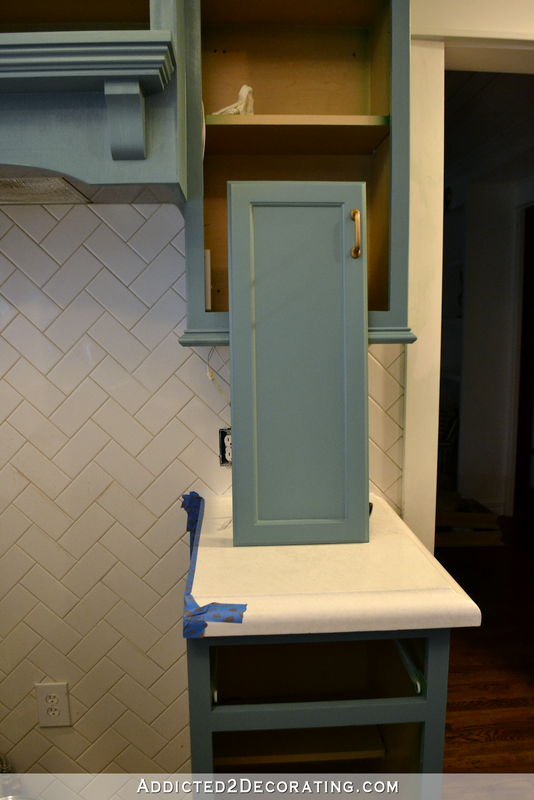 The color is looking beautiful on the cabinets! I agree with Sarah, and personally, I think we are going to see a return to using more brass in the near future. Yep, the brass just looks better than the black with that teal. And I think it’ll look fantastic with the light fixture. Totally agree. The brass looks way better. Plus, spray painted cabinet pulls feel cheap when you use them. The brass matches the lighting too! Agree 100% with Sara. Go gold! I like the brass. I think it looks pretty and offers a fresh contrast. The black just looks dull and ordinary. Agreed. At first I didn’t think the brass would go, but I actually really like it. And I really DON’T like the black… Don’t do the black. If you really want something different than the brass, try brushed nickel or something. I seldom feel this strongly, but that black is just a no-go to me. Agree. The brass gives a little “lift” to those doors, something special. The black does nothing for them. The spray painted black looks very much like the faux wrought iron pulls that all houses built in the 50s seemed to have on their cabinet doors. I think the brass is beautiful! Love the cabinets and your kitchen! It really is a personal choice for the hardware but I just don’t find that the brass and the teal complement each other …. I vote for black! The brass looks better in my opinión. The black pulls look .. I don’t know… cheap? Brass with the teal and white backsplash/counters just looks right to me. Also, since the lighting is staying gold, and the sink is stainless, I like how brass handles on lower cabinets balance the lights up high. BRASS for the WIN!!! The black looks sort of “cheap” Looks great though – love the color of the cabinets! I agree with all of the above comments. I thought I would prefer the black but it just looks dull against the real while the brass looks lovely (and I normally hate brass!). and I can understand that you don’t want to buy new ones – hardware often really costs more than the furniture you attach it to!! I normally hate brass as well but i have to agree that it looks really nice with the teal. Gosh! I am in the corner with those who THOUGHT matte black would be the way to go, but now that I see the two options, go with the brass. I can’t even believe I’m saying that because I am sooooo not a brass fan (I shook my head when I heard it was making a comeback) but really it does look much better. Matte would look much better than the gloss, though, if you do go with the black. I really like the black elsewhere, for what it’s worth. Brass 100%. It looks fresh next to that color. The pulls don’t need to match the rest of your hardware. I’d go for the brass. The black does not look happy and cheerful to me there. I like it on your exterior doors, but I’m not loving it on cabinet doors. I agree with the brass too, for the same reasons! Black pulls are everywhere, the brass is a lovely compliment to your cupboards. I vote Brass!! Brass! It definitely looks soft and lovely. My vote is brass 😍 it looks gorgeous against the teal and ties in your lighting fixture. I’m with you, neither, for me. I would like the oil rubbed bronze, best, myself, but not black. Have you tried that color? I agree with oil rubbed bronze. With the black handles, you see the cabinets. With the brass handles, you see the handles. Brass still screams 1990s to me, so between the two, I would choose black. The paint color looks great! My vote is go for BLACK, it adds the drama needed. I went through the same thing in my kitchen, older kitchen which I renovated and painted. I had the knobs and pulls installed for ages, painted some of the flat black. Everyone who visited said “paint them all black” so I did. I love them. You will too! Brass! I think the black reads as too “low contrast” against the teal paint, while the sparkle and obvious metal-ness of brass provides contrast in color and texture. Team brass. The black on the blue looks too too trite “fake Colonial Williamsburg” for me. I’m surprised but Brass looks great! Kristi, when I first started reading your dilemma, I immediately thought brass even though I love the black on your pantry and other door. After seeing your pictures I am voting for black. It is so striking against your cabinets! The brass looks so much more high end and classier! I am a fan of black, but in your house I think the brass is more your style. Since you have the brass, go ahead and put it on. Live with it for awhile, moving on toward the finish line. You can always come back later and paint or change out. It’s pretty with the blue so you won’t be living with ugly in the mean time! I agree. 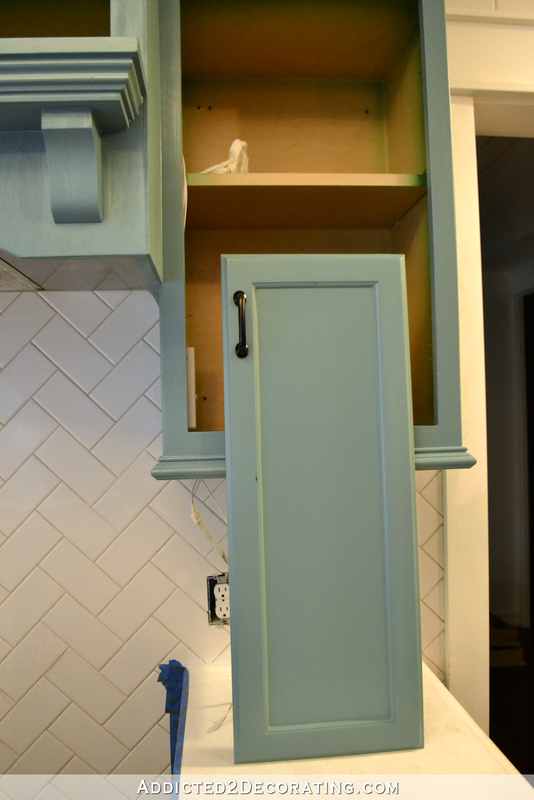 I don’t normally like brass in general, but it looks good with the teal cabinets, and if you live with them and then change your mind later, then you can go back and paint them. I agree. Initially, I thought “black”. Then I saw the prettiness of the brass with the teal. So, “I’m with her”…brass. Change of heart…easy fix to go black. Ditto Vanessa! I prefer the brass, but I like the idea of not taking chances. Live with it, then decide. This was exactly my thoughts also. Try the brass for a while and if you don’t like it paint them black. My vote goes with this group….put the brass handles on all the cabinets….live with it while you work on your monthly list and revisit it with next month’s list of goals. No harm, no foul if you then concretely decide to paint them. Will painted hardware hold up to the constant opening/closing of everyday use of years to come? Is this hardware something you could use in your pantry instead of kitchen? I agree–keep it brass for the time being. When you are finished with it all, and have lived with it for a while and don’t love it, switch it over to black then. The cabinets look beautiful, and either color will work. I wholeheartedly agree with SusanC! See how it looks with brass first! I was sure I wouldn’t like brass on that color of cabinet but I do. As you noted, it has a softness to it I think is appealing. The black…well, it’s kind of harsh and really jumps out at you. After all the work of creating beautiful cabinets, why distract your eye from them? I vote for brass…and, if you stick with brass, you can always change your mind later on! Best of both worlds!! The black makes them look plastic, at least in the pictures. I think brass, especially with your light fixture. Brass – all the way. Plus – especially on handles – I feel like that black will rub off with time. Brass. Spray painted hardware does not stand up to daily use. I’m surprisingly joining TEAM BRASS! It looks intentional and not matchy just for the sake of being matchy. Plus without them is there any brass to tie in the light fixture? Brass for now, no need to add a project at this point, it looks lovely. Live with brass for awhile, but in a few months if doesn’t feel right then revisit it. Perhaps at that point other options will be on the table………maybe brass and lucite or brass and glass??????? The brass gives a furniture look, very elegant. Jewelry! Are you keeping white appliances. If so, the brass seems to coordinate to a softer look overall. However, if you do switch to black appliances later the black would probably tie in best then. Definitely brass and it ties in with that gorgeous and expensive lighting fixture you got awhile back. If you want to use some other metals to mix in the kitchen, you could add something in black in your accessories. Do you need a curtain of any kind? A black stripe or print could give you a match to anything metal in the way of accessories. I have read that as long as your “mix” ties in with something else in the room, it works well rather than looking like random things were placed. I see that I’m in the minority here, but if those are the only two choices, then I go with the black. Definite a matte finish though. To me, the brass looks dated. I love the brass with the teal. Definitely brass. Brings a bit of light to the room. Black is dull on those cabinets. And looks a bit dated, surprisingly. Boy, I didn’t think I would like the brass, but I really do! The black just looks blah to me. Team brass! Definitely matte black. The brass with the teal looks very 1950s to me. BRASS!!!!! The black looks like the cheap plastic handles I had in college LOL! I would definitely tie them to your beautiful brass light fixture. They definitely look like high end hardware when left brass. Please, please, please do not paint them black. Beautiful job you’re doing in the kitchen! We bought our first “big” house (not a townhouse) in 1997, it had been built in 1995 and it was full of yellow “brass.” We sneeringly got rid of it. Then we did the same in our next house. So much yellow “brass” and real brass going to the landfill. It would be hard for me to buy it now. I know what you said but isn’t your kitchen faucet nickel or some other “white” metal, and your sink stainless? Not that you have to match. I agree that the black isn’t right. It looks way too “farmhouse” for you. I don’t hate the gold, but it’s gold. I’m about 10 years older than you so maybe it’s generational. Your brass hardware is beautiful. When I think of brass I think of the fake shiny brass that builders installed all over production built homes. The real brass and brushed brass is making it’s way back in the market and I’m excited to see it. Between brass and black, I would go with the black. Personally, I think nickel would be the best. Can you paint them with a metallic silver paint? I vote for matte black. I’m not liking the brass with the cabinet color. Just an opinion, do what you love! The brass is pretty and a bit unusual. Put them back on and move on. You can tweek them later. Aren’t your front room curtains accented with brass? I love the brass look, and if I remember the curtains correctly, that also adds a cohesion through the rooms if you want it! Stick with brass, live with it for a while, and then decide. I personally would not be able to decide until your kitchen is all put together and all the handles are in place. I’d want to see the overall look. Agree with this. At least put several brass handles on in one section of your kitchen and take a pic for us. Initially, I lean against the brass but a more encompassing photo could change my mind. I assumed I would prefer the black but I do prefer the brass. Besides, you can live with them for a while and if you don’t like them just change them. I’d stick with the brass! I think it gives a touch of elegance and goes with your style. While I like the black as well, it gives a more casual/country feel. Although I really like the black I think you should try the brass for a while to see how you like it. Brass looks sophisticated and unique with the teal color and you would get away from the current black obsession in kitchen hardware. Painting your beautiful brass hardware would be a potential problem if it starts to peel or scratch aside from the fact that it would look…well, painted. Definitely brass. You can always go to black later on for a change if you want to, but I think black as nothing to those beautiful cabinets. Since you cannot decide between the two and they are already brass, I’d install them as is. Down the road you can paint them black if you so decide. But, to go ahead and paint them black and then decide the brass would’ve been a better choice? I have done this and kicked myself for not living with something for a while before changing it! I agree with those who suggest that you live with the brass for awhile and then paint if you decide you want black later. 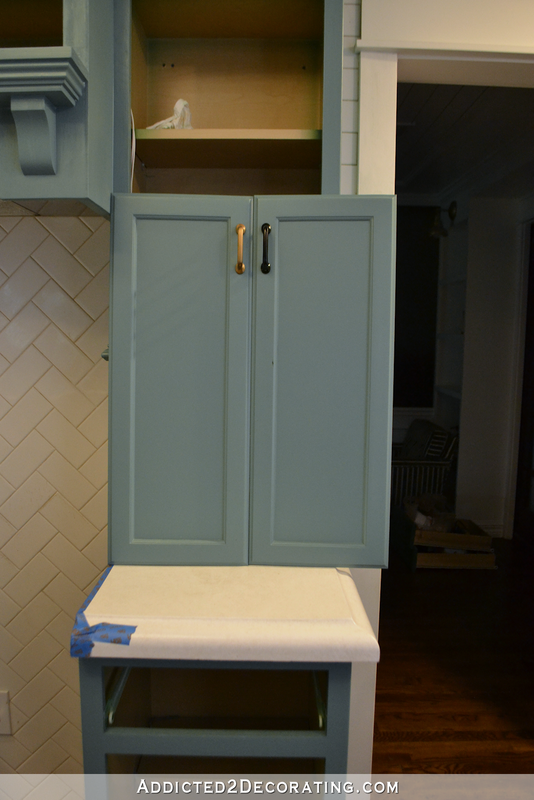 The brass really compliments the teal cabinets, to my eye, where the black would steal the show. These comments are interesting. In no way do I see the black as looking cheap, however as another commented, I do think it lends itself to a farmhouse feel. I like them both but will vote brass for the vision of the entire home. I like both of them, I can see your challenge. Take each of the cabinets into the breakfast room side, down low and see how it compares with the breakfast room decor. I’ll be that makes the decision. The black pops more…. I’m all for the brass!! It looks great with your cabinets and it also pulls in the color of your ceiling light above. Your brass is a perfect choice! And I am in love with the stove fan makeover! It really makes the kitchen look so much more elegant! Great job! Brass, hands down. Besides, paint won’t hold up on brass hardware. Ask me how I know….. Anyway, it’s lookin’ good, Kristi! Matte black gets my vote! Like how it feels! Obviously in the minority, but I love the black, especially if you go with the flat paint. Maybe this is because I have black hardware on everything in my house and I love it. I also have black light fixtures. It’s your house, so go with what YOU like. I love the brass, I think it looks amazing with the kitchen cabinet color. Whatever you choose, it’s going to look great. Brass. I like the way it “speaks” to and with your lovely brass light fixture. I would try the brass for now and see how you like it you can always change later. On another note though I’m wondering about the sprayed doors with the brushed cabinet. How are you ensuring the sheens will match? I’m in the middle of redoing all my kitchen cabinets and opted to brush everything since spraying inside the house was not an option for me. Brass! The black makes it look cheap IMHO. I love the black on outside doors, not on the cabinets. I don’t care for the harsh dark on the light teal. Brass + teal = beautiful and unique – sort of what you are known for Kristi!! The handles will not be only in the kitchen, they will also be on the cupboards in the breakfast room. Brass would be more harmonious with both light fixtures and I feel, would be more complementary to the colours of chairs. I like the idea of matt black… or distressed black… or antiqued brass. To me, the brass by itself seems a bit too warm with the teal. I’m conflicted like you, Kristi. But I do seem to prefer brass over black. Live with the brass pulls for awhile then decide. 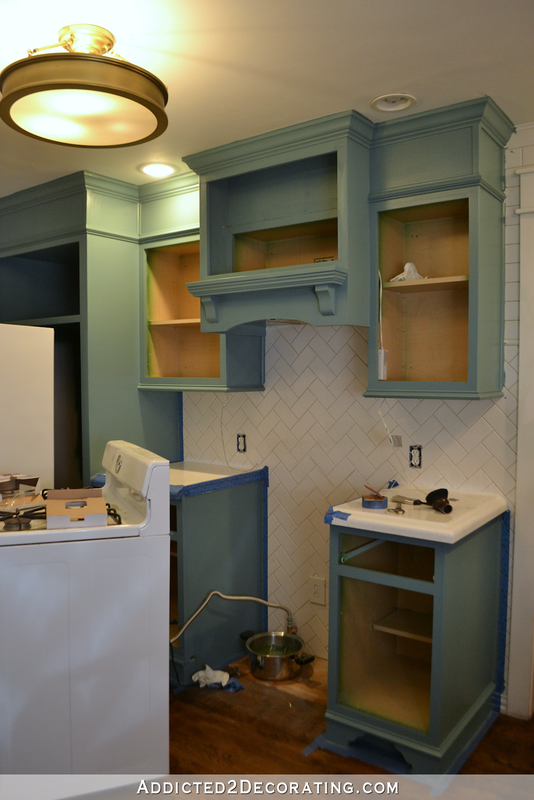 Firstly, loving the cabinetry color, and the fan hood looks amazing! I agree with a lot of the other comments, stay with the brass……..if later on you decide against it, then you can always spray them black. If it were me, I’d definitely live with the brass first. Well, I can see I’m in the minority here but I vote for the black hardware. I like the continuity throughout the rest of your home. I vote for the black. The brass does not complement the color of the cabinets, it looks a bit gaudy. I feel like you would need more black accents in your kitchen to pull off the black handles. My eye and gut went straight to the brass! I like the black hardware and think it would make for a cohesive look throughout your home. Definitely Brass!!!!! And I love the new color, it looks soothing and fresh! MATTE BLACK—–not even close. Much better flow and stronger design sense. Normally I would go for black and continuity. But I think the brass looks better with your cabinet color, your counters, and the backsplash. I like how the brass has the varying colors whereas the black is just plain. Plus if you had just one tiny chip or scratch on the black it is going to be a mess to redo. What color is your faucet?? Make sure that’s isn’t going to bug you if they are different. If I remember correctly, it’s silver. Go with the brass. It gives a little pop. ANd a bit of uniqueness that is enjoyable, really many don’t have brass in their kitchens. Brass. It compliments the interiors (I can’t remember if you have glass on some of the doors?) and the light fixture. Absolutely the BRASS! 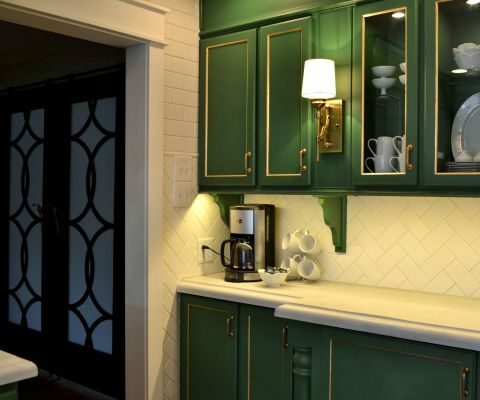 I think the brass cheapens the look of those gorgeous cabinets, backsplash, countertops AND the lighting! Of course, brass is also “IN”! Can’t wait to see which route you go, but I sure hope it’s the BRASS. The brass looks much better, and I am not even a brass girl (have not jumped on the bandwagon just yet.) Normally I love black, but it just don’t look as nice as the brass does with the teal. Brass, brass and brass. That hardwear is gorgeous. You need the contrast between the brass and real. The black blends in and is barely noticeable. I am loving your cabinets. Actually everything you’ve done. So envious of your many talents. You always make it look so easy even when we know it’s not. One day (fingers crossed), I will attempt painting my cabinets. My vote is brass although I’m shocked. I normally don’t like it. But I have to agree with others. 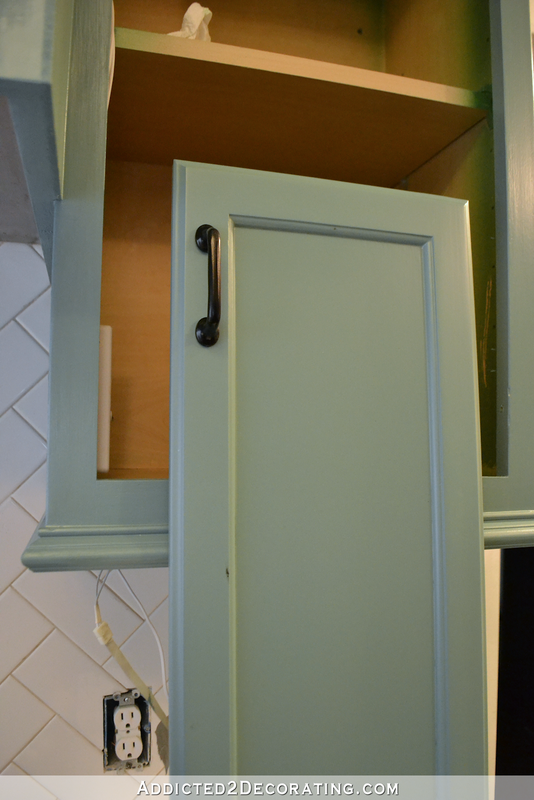 Your cabinets look brighter and “happier” with the brass hardware. I vote for brass. Mixing metals is more elegant. Brass is “in.” The black looks great on your charcoal doors, but the brass will be much better on your cabinets instead of be “matchy-matchy” with other hardware and it will tie in the light fixtures. 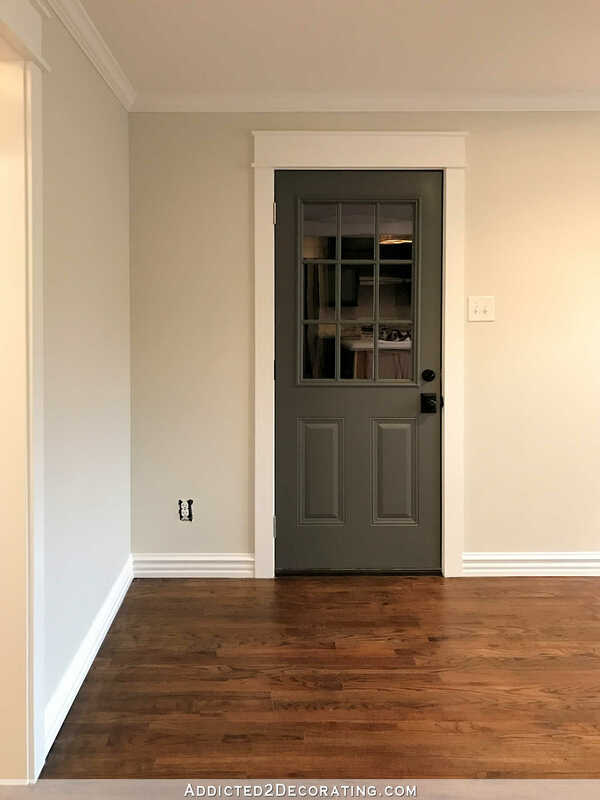 The black door hardware color can be repeated in small doses in other ways. So — Brass! Go for the gold. The black is almost expected. The gold is elegant and gives it a higher end look. Which grain filler did you use on your oak cabinets? Brass…when I squint my eyes I can see the black in more of a matte finish, and I still think it’s too harsh. Live with the brass. You can always paint it Black later but you can’t go back to brass once you’ve painted them. When I first read brass or black, I was definitely team brass. When I saw the pictures, I was really TEAM BRASS. It looks lovely. Brass/gold finishes are so in. It looks like pretty earrings and an accent piece, the black is just too jarring and interrupt my thoughts when looking at the pictures because of the contrast. I like the darker, however, the brass with your other elements is a better choice! Looking great…can’t wait for the FINISH!!! The original brass, without a doubt. Even if the black was matte, you don’t want your house to be all “matchy-matchy”. I have been to a few home shows this spring and brass is back. Restoration Hardware is featuring a lot of brass hardware in their showrooms as well. As soon as we all painted over all of our brass, it’s back and beautiful! I say leave it for sure. The teal is much prettier than the original green. I like the black hardware but not so much that it would be worth scrapping the brass, which is perfectly acceptable. I love the black personally. That being said, if you are torn, put the brass on. Move on to finishing up other things. YOu will either be happy you went with. the brass; or, you will still want the black. At that time, you can take the hardware off and paint it at a time when you don’t have so many other projects waiting in the wings. They are both pretty in your chosen color. I like the brass with the blue. 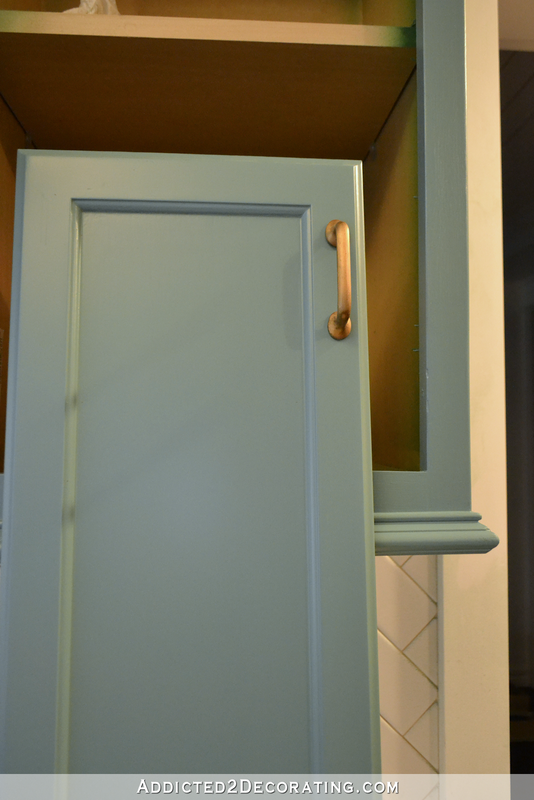 I’m not a huge fan of brass…but I like it on this color cabinet. Although I like the black on the other doors, I like the brass handles for the cabinets. It ties in with your lighting in the kitchen and breakfast room, and looks more ‘elegant’ than the black. The black handles look more ‘farmhouse-ish’ to me. The brass looks tons better than I expected. Keep it brass for sure! Brass vote- part of what looks good about the cabinet color is, it works well with what you got. Resist the design creep! (for now) Waiting gives you time to forget. If the want persists, then find if it’s the shape and/or color then table it. When you choose hardware for your new studio build, get something that really makes you happy. Recycle the pulls into the studio, or save by ordering in bulk. I’ve never commented, though I read your blog daily. I also didn’t read all the comments so I’m sure it’s been mentioned, but I wouldn’t recommend spray painting your hardware. Especially kitchen hardware. I’ve done it, and sealed it, but found it really didn’t hold up to daily use and cleaning. I’m all about spray painting basically anything but have learned my lesson on spray painting hardware that gets any kind of regular use. Plus the brass looks so pretty. If you really decide you like the look of the black better I’d bite the bullet and buy black hardware. Definitely go with brass. The black makes it look dull to me while the brass brings out the teal color. I like the matte black over the brass. Have you thought about spray painting them copper? I think that would be pretty against that beautiful shade of blue. 🙂 Just a thought! Oh the Brass! It’s so rich looking!! There is nothing like green and gold….beautiful combo! A absolutely no brainier Brass all the way. Looks and lifts the colour on the doors. 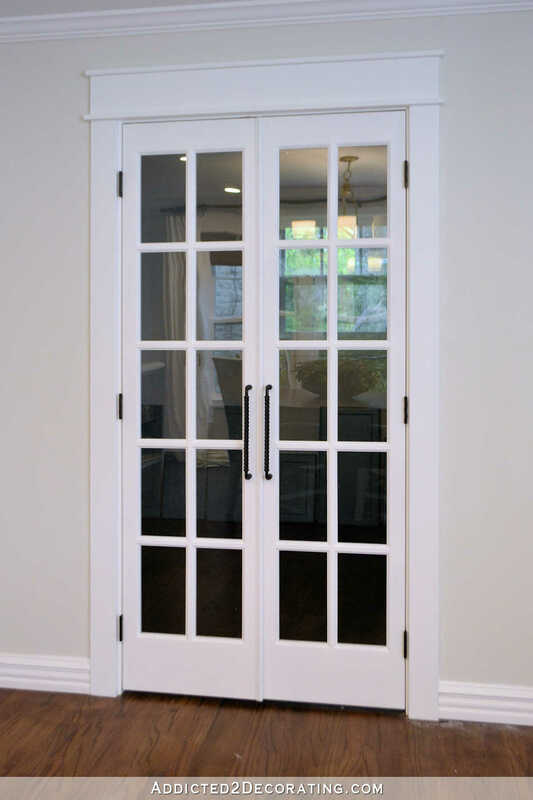 Hi Kelly: When I had a carpenter put up a security stair rail, I asked for black hardware to match the steel posts. The carpenter took plain brass hardware, spray painted it black and then told me his secret. He put the hardware in the oven at 275 degrees for an hour and let it cool completely before removing it. He said the paint would never chip. It’s been twenty ix years and not a chip in sight. I thought you’d like to know. Can you tell? I vote for black. It’s a subtle way to connect your rooms. Happy painting. IRL I prefer black or silver, but your brass hardware looks so very nice on that beautiful cabinet. So beautiful; I think it sets the kitchen apart from the rest of the house, in a very wonderful way. Subtle and rich. I want to start by saying you are so incredible and fearless! You probably didn’t need that but your blog really inspires me; which is why I check every other daily to see if you’ve posted something new. You’re the reason I bring up blue cabinets monthly to my boyfriend (circa condo days – I’ve almost sold him). I’m not going to lie, as I read this when I got to the black or brass I was sold on black… until I saw it. The brass still looks best in my humble, non-designer opinion. I agree with the shine on the black though so, maybe my opinion is jaded. Personally, I prefer the brass. And the cabinet hardware should not match the door hardware. That’s just too matchy, matchy. I also did not think I would like the brass, but I do. 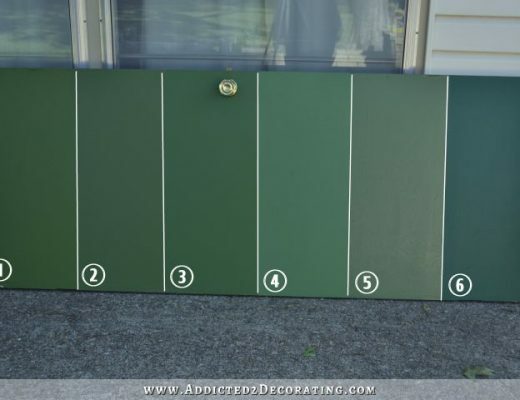 I am remodeling and have lots of doors, so i experimented with painting my old brass knobs on four doors (kitchen pantry, laundry room, half bath, and door to garage. I used automotive primer, then oil rubbed bronze, and a final coat of matte lacquer. They turned out much better than I expected! I tried some old brass knobs, but didn’t like the look and ended up buying new ones. Love the new Teal color. I do think spray paint is one of the wonders of the world! I’m on team “It’s not my house” but truthfully I like both. If you decide on black, Rustoleum makes a matte black auto spray paint. I think the barbeque/high heat/appliance one that someone else suggested is actually satin black. If you like the brass and it’s good quality, then keep it. Will that paint Really come off the inside of the cabinets ? Yes, it really will come off. I don’t know what the interior of those cabinets is covered in, but nothing sticks to it. I really like the gold, it gives the kitchen the upscale, expensive look that it deserves. The black seems too stark against the cabinets and cheapens the look in my opinion. I do like the idea of incorporating mixed metals though, perhaps just elsewhere! Stick with the beautiful brass! You can always change it down the line, but the brass is gorgeous! Like many before me I think the brass are a softer look and tie in with the light fixture…. it is also a much softer look than the black which I think is very cold and harsh. I LOVE the colour of the cabinets… they are gorgeous. Just a quick question… have you used self-leveling paint? If not how do you get a smooth finish? Well I’m surprised so many vote for brass. Of the two choices I would go with a matte black. I do Like the suggestions to go ahead and put the brass on and live with it for a while. No harm in doing that while you get the rest of your dining room and the pantry done. If you pull in some accessories in varied metal finishes that might help the brass look at home in there. If neither color seems right down the road, maybe you can rational new knobs and pulls for the kitchen and use these brass ones in your pantry and/or your new workshop area. Like wa noted above, the new brass today is a softer unlaquered matte look, which doesn’t evoke the shiny brass of the 90s. (Some blogs have been stripping the lacquer off old knobs and pulls to get to today’s look.) I like the brass and it ties not just to the kitchen fixture, but also to the breakfast room. And rather than extend your April project list, agree with those who suggest pressing on with the brass for now and living with it for a month or two. Then if you want to change, add it to a new months project list. Onward! I hope this helps you even if you choose to stay with the brass for this project but are looking for a great matte black in the future. You have helped me so many times that it would be nice to know that I could return the favor. Hi, I am finding your blog very interesting. Can I ask, how did you learn to be a carpenter? 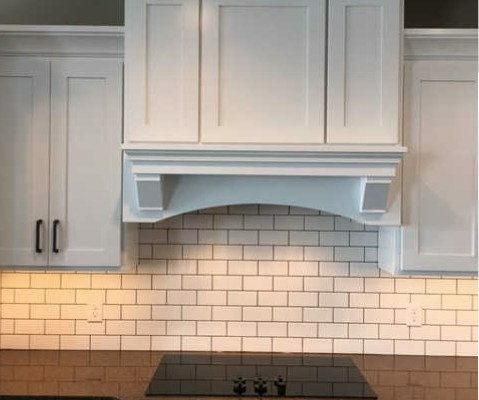 Also what kind of paint to do recommend for painting kitchen cabinets. You have probably written about both of these questions, but I am relatively new to your blog and can’t find the answers. Thanks for this very informative website. You are pretty amazing. When it comes to building, I’m pretty much self-taught. If I don’t know how to do something, I research it, watch videos, and then try it. It’s a learning process, and much easier if you start small and gradually increase in difficulty with your projects. For kitchen cabinets, I suggest Benjamin Moore Advance paint. It’s formulated specifically for cabinets and trim. The brass would definitely be the color I vote on! It glows so beautifully in the candlelight! The black looks tacky – I bet you would regret painting them within a week! The brass keeps the kitchen tone fresh (light and whimsical- not possible with black hardware) and doesn’t seem ‘IKEA’ matchy matchy. My favorite homes don’t try to hard to match throughout- they just work! Huh. When saying it, I thought black. Then I saw the brass and there’s just something about the colors that looks more classy and just works for me. Love the brass and love that all the hardware in the house won’t match. I definitely vote for the black – if it were my house. However, I think the idea brought up earlier is the best. Since you love the brass, keep it. Then you get to cross it off your list. THEN if later who want it different, you will have lived with the brass long enough to know and you won’t regret painting them at that time. I wonder if you could figure out how to get an oil-rubbed bronze look, which would kind of be a bit in-between. Either distress the black paint down to the brass and clear coat it or spritz it with some antique brass paint? I think of kitchens & bathrooms as jewel box moments in a home. (The one exception, is when one is wide open to other spaces like a true great room with dining & lounging or a master en suite open to the bedroom & sitting spaces. In that singular instance, I think it needs to meld with the design style in the room so it’s seamless instead of standing on it’s own.) Jewel boxes are special & elevate the mundane/ordinary (think everyday wristwatch & simple wedding bands). Likewise so should the “jewelry” of those rooms (hardware & lighting) ideally. While I personally love the drama of contrast in spaces & naturally in my head would lean to the black instinctively. This is one of those occasions when seeing it is believing…brass for the win! It elevates your kitchen space to something special, rare & beautiful all @ once. Which I’m sure, we all can agree is exactly what it is! I love the brass, and from experience I would avoid spray painting hardware especially kitchen hardware. You love to cook and use the space heavily from what I can gather. Even on the best day it will be disappointing. I know the majority will win, but I really love the black. I like both hardware finishes. I saw something not too long ago that was a way to “antique” frames where the person used vaseline to rub on the areas they wanted the first coat color to show through and then painted over it. when the paint was dry they wiped the vaseline areas off and the below color could be seen. I was thinking this might be a nice effect and i have seen it before on oil rubbed bronze that was so popular a few years ago. Yours would instead be black with subtle brass showing through. I was thinking this might look good in your house since it is older and would give it a lovingly used look in the kitchen.